There’s something about having time, having had a great workout earlier in the day, and having some new “toys” that make me get super creative in the kitchen. 1) In a small saucepan combine 1/2 cup coconut milk, 3/4 tbsp curry powder, 1/2 tsp True Lime, salt. Bring to a boil. When boiling, add couscous, and immediately remove from heat and cover. 2) While waiting for liquids to boil, add 1/2 tsp coconut oil and 3/4 tbsp curry powder, to large sauté pan. When liquified, add vegetables, 1 tsp True Lime, and salt. After veggies start to brown, add 1/4 cup coconut milk and continue to sauté. 3) While veggies are cooking, liquify 1/2 tsp coconut oil in small sauté pan with 1/2 tbsp curry powder. Add scallops, 1/4 cup coconut milk, and turn every minute or so until cooked and browned on each side (if frozen, ~7-9 minutes, if thawed or fresh, ~3-5 minutes). Do not over cook; the scallops should be tender when forked. 4) When couscous has absorbed most of the coconut milk mixture, add 1 tsp honey and 1/2 tsp True Lime and put back over heat and mix together. 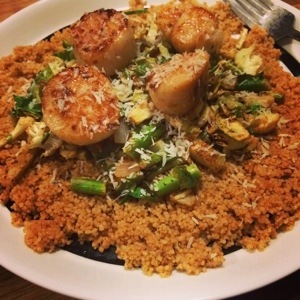 5) Serve couscous, add veggies, and scallops to plate, then sprinkle with coconut. Enjoy!